Eagles right tackle Lane Johnson (left) and right guard Brandon Brooks (right) know the week before Super Bowl week is important for being ready to play. This is the week for work. Coaches with Super Bowl experience often say that the first week after the conference championship, when you're still in your own facility and the distractions are manageable, is when you install your game plan and do the bulk of the preparation for the game, though kickoff remains more than a week away. Once you're on site – in this case, Minneapolis, where the Eagles are scheduled to arrive at 3:30 p.m. Sunday – there is going to be a Prince cover band playing in the hotel lobby, while your cousin texts you for tickets, the buses to practice get lost and circle the Mall of America, and you have to sit at a table answering the same questions every day from wave after wave of reporters from every nation on Earth. 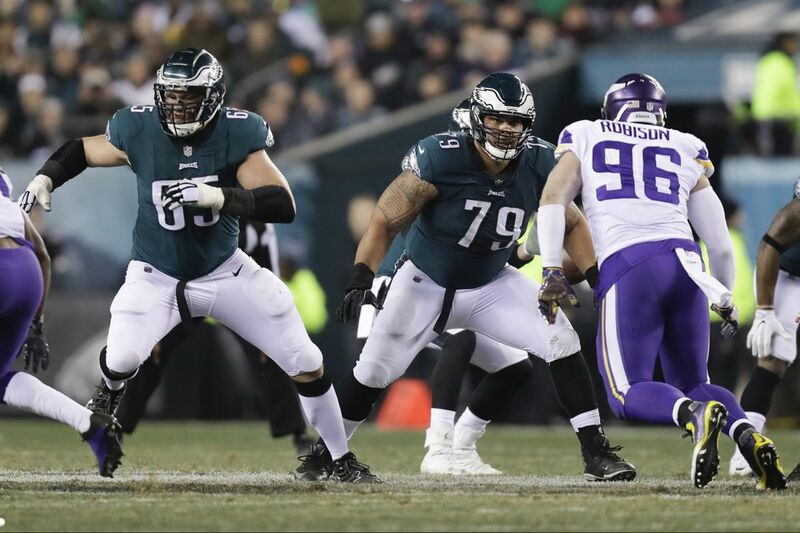 "Chaos, man," Eagles right guard Brandon Brooks said Thursday, when asked what he imagines next week will be like. "Other than the game, which will be like any other game, once you're inside the white lines, everything else is going to be different. The lights are brighter." The Eagles wore pads for Thursday's practice. Tight end Zach Ertz said they are "going at it as if we're playing this weekend." Eagles coach Doug Pederson reiterated that message, but he also stressed that "it's not a vacation next week." "We're going to prepare this week as if we're playing this weekend, obviously, and then we can sort of fine-tune some things," Pederson said. "But we've just got to stay on top of our game, keep the grind, and keep the intensity going right into next week." Concerning distractions next week, defensive end Chris Long, who played in last year's Super Bowl as a New England Patriot, said, "It's all your mindset, it's how you prioritize things … . If football's the most important thing to you, and playing a football game is why you came, you're not going to be worried about everybody asking if you want to go get dinner, or this appearance, that appearance, that interview. "That's part of it – on a normal game week, you might do an interview, might go out to dinner with your family. Those aren't distractions. But it's just the magnitude of everybody that's made the trip to Minneapolis [saying] like, 'Hey, I'm here, you owe me some time.' The biggest message I can give the guys here is, you don't. You gotta get good at saying 'no' for a week." Normally, bye weeks are for rest and maybe getting ahead on watching film. But not when there are only two teams and one game remaining on the schedule. "This isn't your regular bye week, because it's very focused," Long said. "There's one game left, no matter how you slice it, and we've got to pour everything into that one game." Eagles’ running back LeGarrette Blount scores a touchdown in the Eagles’ NFC championship win on Sunday. Running back LeGarrette Blount has been to two Super Bowls with the Patriots. Asked what he's learned about navigating the experience, Blount said: "Basically, just the distractions. There's going to be a lot of media, there's going to be a lot of family members, there's going to be fans calling … . You gotta tune it out, ignore it, give it to someone else to handle, and just focus on what you gotta focus on. Let it go. Let my mom handle it, or let whoever else handle it, and just focus on what I focus on." Right tackle Lane Johnson said practicing this week as if there were a game this weekend helps the team's effort to "keep everything the same, don't make it bigger than what it is, even though, obviously, it's a huge stage. Keep the main thing the main thing." Safety Rodney McLeod said it's important to work hard this week to "make sure we've checked off every box, whether that's things that have worked against us, or things that we see that will be effective against them." The other thing about next week is that the Patriots, with their five Lombardi Trophies, become less of an abstraction. The Eagles will be face-to-face with the fact that they are trying to interrupt the preeminent dynasty of this century, will be face-to-face with Tom Brady and Bill Belichick scowling at them from every TV monitor. "That's a real issue that you have," Pederson said about the Patriots' mystique. "These guys have been there. They've done it. They've proven it time and time again. My biggest focus with the team is, let's just focus on today. Let's just win today. Let's get better today, and we'll worry about that when we get to the game." As several players have said, obsessing over New England's success won't help beat the Patriots. "If I make this all about them, we're in trouble," Pederson said. "Everything is going to be written about it. Everything has been written about it, talked about it, discussed, debated, and it's about us … . It's what we do and how well we execute."